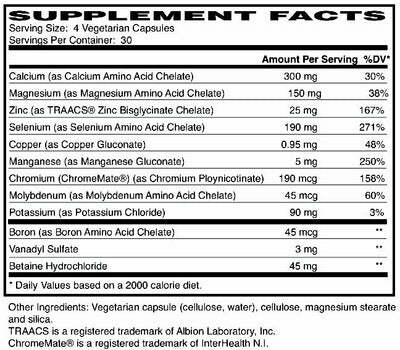 Magic Minerals is a Balanced Chelate. The most common mineral deficiencies involve Zinc, which is necessary as an enzyme co-factor involved in over 100 different enzymatic reactions. The most sensitive aspect of human biology to become affected with zinc deficiency involves the immune system. Selenium deficiency arises from dietary inadequacies that have developed in the same manner as with zinc. Important for the proper performance of an enzyme 3-3',5' deiodinase, selenium deficiency results in sub-clinical hypothyroidism. Weight gain results, body temperature drops, and a variety of symptoms develop. Depression, Syndrome X, Fibromyalgia (FMS), and Chronic Fatigue Syndrome (CFS) commonly develop. Chromium and Vanadium deficiencies develop insidiously over time. The biological importance of chromium and vanadium is becoming better understood. Necessary for insulin receptors to work properly, and chromium and vanadium deficiencies result in 'insulin-sensitivity.' Deficiencies in these minerals result in conformational changes in the insulin receptor. This renders the receptor less sensitive to insulin, and the pancreas has to secrete more and more insulin to keep blood sugars stable. Insulin has another action other than that of glucose control. Elevated Insulin levels push triglycerides into the fat cell, with the net result of weight gain. Manganese, molybdenum, copper, calcium, and manganese contribute to a number of body systems, the musculoskeletal system being the most commonly influenced. Copper deficiencies can result in connective tissue disorders, including a hernia, osteoarthritis, aneurysm, hemorrhoids and varicose veins. Copper and manganese should be taken in a balanced ratio with zinc. Calcium - Essential to the integrity of a bone structure, and calcium loss results in osteopenia, osteoporosis, and fracture. If calcium is taken with boron, absorbance is enhanced, and much less is needed to maintain bone health.